This map illustrates satellite-detected areas of displaced person settlements in Baidoa town, the southwestern capital of Bay region in Somalia. 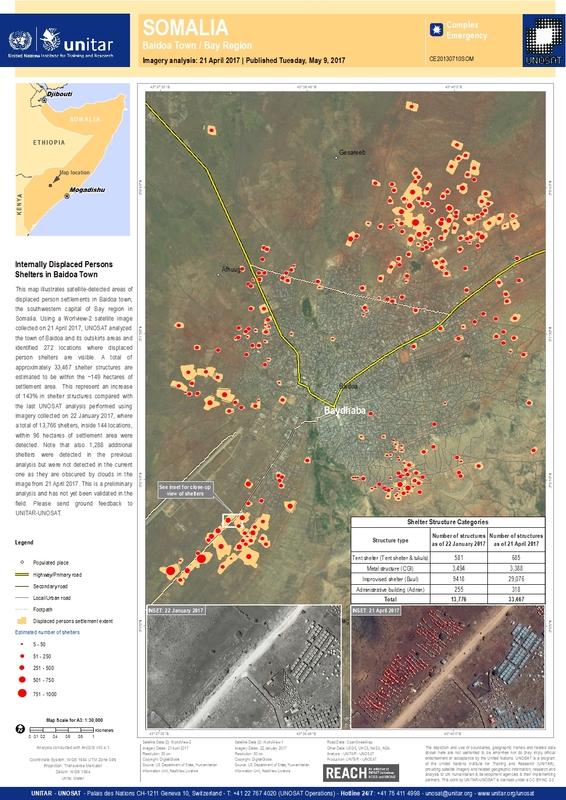 Using a Worlview-2 satellite image collected on 21 April 2017, UNOSAT analyzed the town of Baidoa and its outskirts areas and identified 272 locations where displaced person shelters are visible. A total of approximately 33,467 shelter structures are estimated to be within the ~149 hectares of settlement area. This represent an increase of 143% in shelter structures compared with the last UNOSAT analysis performed using imagery collected on 22 January 2017, where a total of 13,766 shelters, inside 144 locations, within 96 hectares of settlement area were detected. Note that also 1,288 additional shelters were detected in the previous analysis but were not detected in the current one as they are obscured by clouds in the image from 21 April 2017. This is a preliminary analysis and has not yet been validated in the field. Please send ground feedback to UNITAR-UNOSAT.